The Lighter Side of Ratatouille. Today we were at the farmer’s market and the produce was outstanding. It led us to think of how to make a satisfying lunch of a few vegetables. Lately we have found ourselves creating some pretty remarkable dishes using what’s in season and what’s local. Farmers aren’t given enough credit for their hard work and passion for growing wonderful wholesome food. Thankfully these Two Food Nuts appreciate everything that they put on our plates. 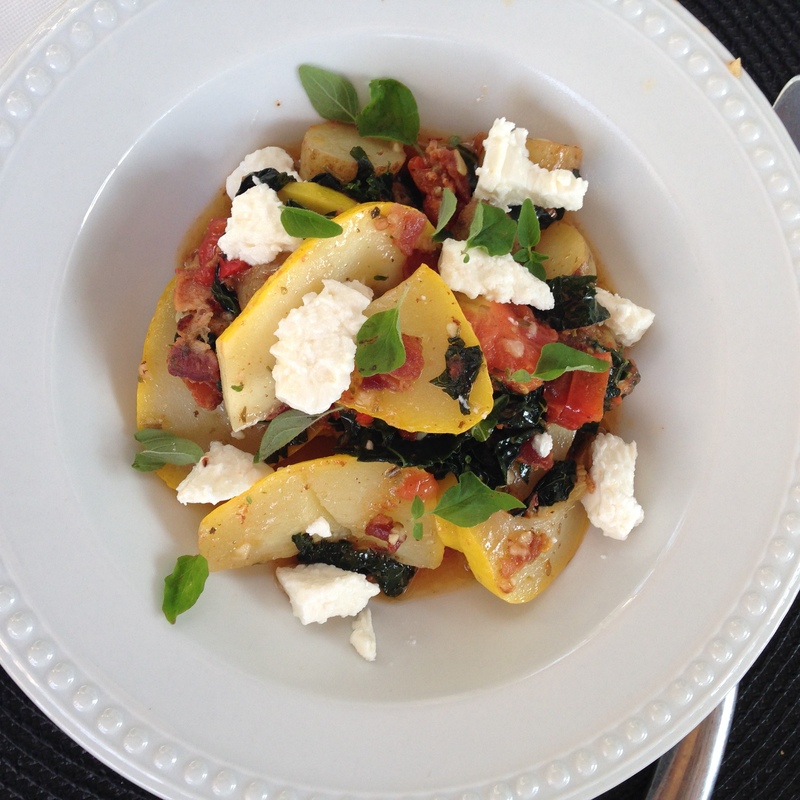 Ratatouille is a dish found in Provence. It is a comfort food, made with a tomato base and lots of winter vegetables. It’s the inspiration for this lighter summer version. Just look at those colors! A few humble ingredients put together with a pinch of love and a few herbs! I know of a few restaurants that should be jealous of this creation! The beauty of this dish is it’s simplicity and variety. You can decide what you want to add into it. Look at what’s in the market and what your family enjoys eating. Go ahead be brave! To make this a vegetarian dish simply leave out the bacon. There is still so much flavor with just the vegetables. This recipe serves two as a main dish or 4 as a side dish. 15 of tiniest potatoes halved or one thinly slice one large potato. 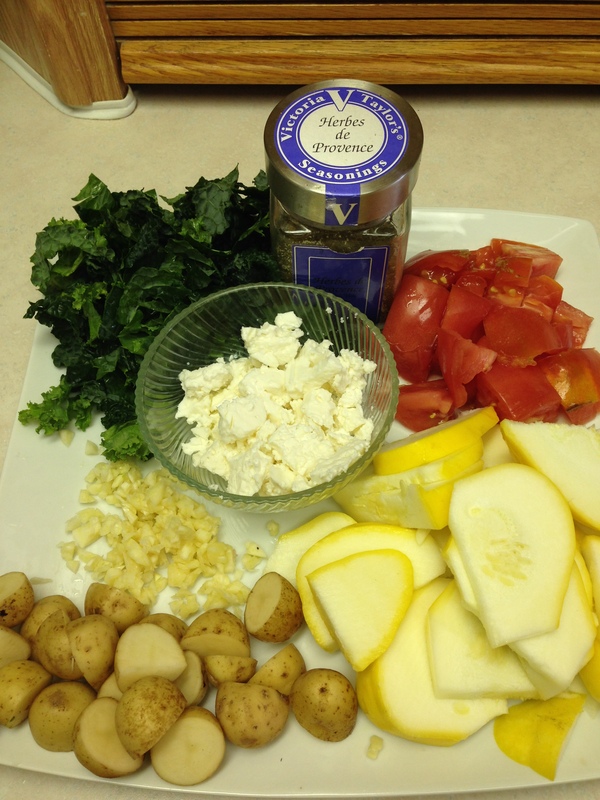 5-6 leaves of CavoloNero (Italy’s black Cabbage) or baby kale leaves and Greek Feta to finish. Notice there is no salt in this dish. We found the bacon and the Feta provided all the salt that was necessary. The chili brought the mild heat so no pepper was added either! Begin by putting the bacon and oil in the skillet. Fry on high until the bacon is just beginning to brown. 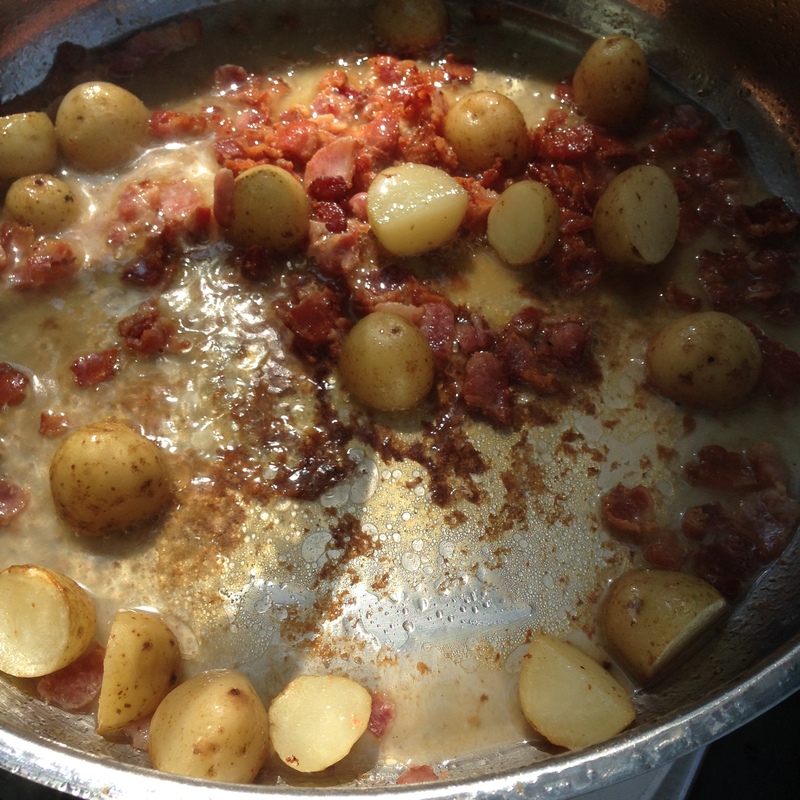 Add the potatoes now, stir to coat with the bacon fat and oil and add a small splash of water. Cover and cook on medium-low to allow the potatoes to soften. After a few minutes, add the garlic and layer on the vegetables and the herbs and chilli. Cover, increase heat to medium high and allow all the ingredients to soften and the flavors to mingle. 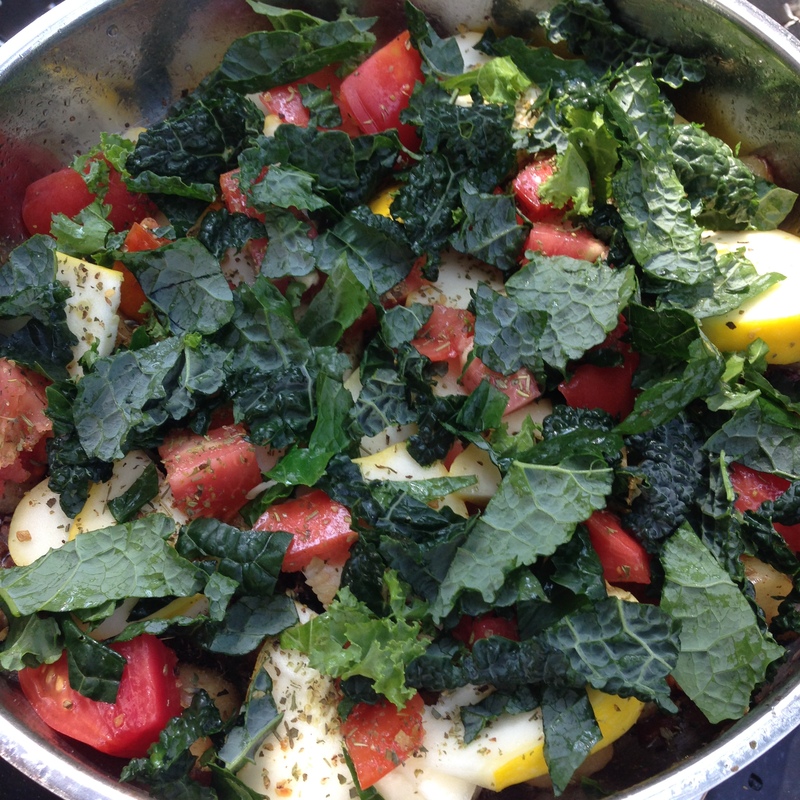 This only takes a few minutes but depends on the density of the vegetables used. Once everything has cooked down and you can see a light broth in the skillet, your Ratatouille is done. Grab a big bowl and some amazing bread to sop up all those glorious pan juices. This dish can include other vegetables such a sweet peppers, snow peas, green zucchini, kale, sliced brussels sprouts, mushrooms or rapinni. It’s whatever you love.